Along the beach are a number of poles standing at equal distance from each other. The poles are numbered 1, 2, 3, 4, ..... Alice is walking from the first pole to the last one and back, Bob is doing that in the opposite direction. They start at the same time and walk with constant, but different velocity. Their first encounter is at pole number 10, their second (when they're both on the way back) at pole number 20. How many poles are standing along the beach? In a group of 200 people, everybody has a non burning candle. On person has a match at lights at some moment his candle. With this candle he walks to somebody else and lights a new candle. Then everybody with a burning candle will look for somebody without a burning candle, and if found they will light it. This will continue until all candles are lit. Suppose that from the moment a candle is lit it takes exactly 30 seconds to find a person with a non burning candle and light that candle. 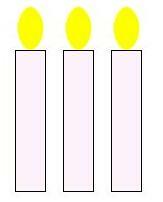 From the moment the first candle is lit, how long does it take before all candles are lit? What are the next numbers in the following sequences?